I used a power drill in a stand with the blank held in a machine vice, so when this dedicated pen blank drilling vice arrived for review, my first reaction was to wonder whether this might be a solution to a problem that did not exist. Having used the pen blank vice I was pleased to find that it does resolve a couple of problems that used to irritate me when drilling using a drill press or a drill in a stand, namely getting the blank square to the drill bit in both planes, and centring the drill on the blank each time. 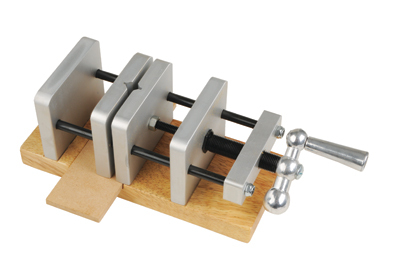 The pen blank drilling vice resolves the first issue by having two 'V' grooves machined into the face of its jaws to hold the blank truly vertical, and the second by having a twin thread mechanism that moves both jaws simultaneously, so that once the drill chuck and vice are aligned on centre, they will remain on centre whatever size blank is inserted into the jaws. 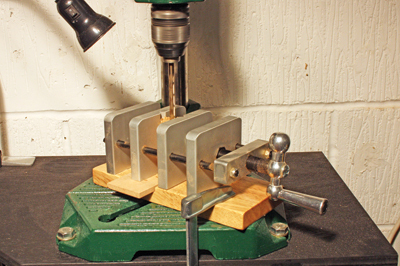 For those pen makers who have problems getting a true bore using other methods, or for anyone just setting out who needs a holding device for pen blank drilling, this dedicated vice will be just the thing. It is robustly made and comes with a sacrificial insert to prevent damage to the base as the drill breaks through the end of the blank. The screw mechanism works smoothly and accurately and the machined grooves are true to vertical. Like all holding devices, it should be clamped to the table of the drill press or stand for safety. I thought this was a well constructed vice. Like Walter, I use the tailstock drilling method for pen blanks but this item intrigued me. Not only for drilling pens, but also larger square sections and rounds for candlesticks and similar items. The jaws move easily and there is very little play in them which makes for greater accuracy. The hold is very secure and vertical in the grooves, making light work of such projects.